If you had the chance to look seven years younger in less than 10 minutes, what would you do? Dr. Sarnoff served as an investigator in a landmark clinical study that provided scientific proof that just one treatment session with facial fillers can make you look, on average, 7.3 years younger! BeautyShots at Cosmetique is a state-of-the-art center exclusively devoted to the safe, skilled administration of Botox® and a full line of the latest facial fillers and other injectable products. Dr. Sarnoff and Dr. Gotkin are experts in the administration of Botox and all facial fillers, including Juvéderm®, Belotero®, Radiesse®, and Sculptra®. 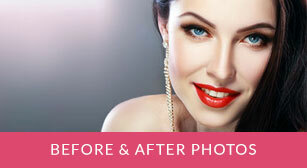 They erase frown lines, wrinkles, and carefully augment your lips – with minimal down time and immediate results. They are also experts in improving the appearance of your hands through the use of injectable products and laser treatments, and diminish unsightly “spider veins” through sclerotherapy and laser treatments. Dr. Sarnoff and Dr. Gotkin are on the faculty of the Botox Cosmetic Physician’s Network and train New York’s finest physicians on the expert administration of injectable products. Botox is the only FDA-approved treatment for the temporary reduction of moderate to severe frown lines. This simple, non-surgical procedure relaxes the muscles that cause lines to form, limiting their ability to contract. Over a million people have been treated with Botox since its approval in 2002. How long does a Botox treatment take? What is the recovery time? The average treatment takes approximately ten minutes – there is a noticeable improvement in days; within a week or two you will see the full effect. There is no down time. You can receive a Botox treatment on your lunch break. Results last four to six months (individual results may vary). Restylane is a facial filler that restores volume and fullness to the skin to correct moderate to severe wrinkles and folds. Restylane can also be used to shape facial contours and improve the shape of the lips. Results are instantaneous; treatment takes only a few minutes. Restylane and Botox work together to complement one another. Treatment is long lasting but not permanent. The length of time a treatment maintains its effect depends on many factors, such as your age, skin type, lifestyle, etc. Most patients choose to have a follow-up treatment after six months. I’ve heard about Juvéderm, Radiesse and Sculptra. How do I know which filler is right for me? Call Cosmetique to speak with our patient coordinator or to schedule a consultation with Dr. Sarnoff or Dr. Gotkin. They will help you decide which cosmetic alternatives are the most effective for improving your appearance.